Google Voice allows for cheaper calls to other countries, compared to most telecom rates, and free text messages. (CNN) -- Apple began carrying Google's free voice app for iPhone on Tuesday, after the application hung in limbo for more than a year. The Google Voice app interfaces with the Web service by the same name. Voice lets users register a new phone number where calls can be forwarded and organizes voice mail, text messages and call logs in a central inbox. Google submitted its iPhone app in June 2009. Six weeks later, Google said its app still hadn't been approved. At the time, Apple carried a handful of third-party apps that hooked into Google's voice service. Not long after the U.S. Federal Communications Commission inquired into this public dispute, Apple took down all apps that interface with Google Voice, including one called GV Mobile. In Apple's response to the FCC, the company expressed concern that these applications replace key functions of the phone and may cause confusion. Apple tests all apps for bugs -- as well as compliance with the company's contentious and somewhat ambiguous rules -- before they are admitted to its online App Store. Google has other apps for the iPhone, including one for its search engine that allows users to input text, voice or pictures from the phone's camera. But with no way to get the Google Voice app past Apple's guards, Google created a mobile-optimized website for iPhone and other smartphone owners to use with Voice. However, websites cannot achieve features that apps can, such as system notifications and integration with a phone's address book. But then Apple suddenly began approving third-party voice apps a couple of months ago. They were mainly pay-per-download programs. Google declined to comment at that time, instead pointing people to the Web version. On Tuesday, Google's free software appeared in the App Store. Google already has voice apps for its own Android mobile operating system and for Research in Motion's BlackBerry devices. Those apps work more seamlessly with those phones than the iPhone version. 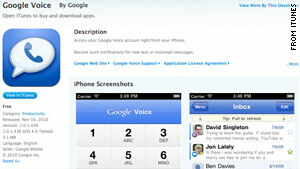 But in our testing, we found Google Voice for iPhone to be well designed. While calls made through Gmail on a computer are connected over the internet through a technology called VoIP, the iPhone app routes calls through traditional cellular telephony protocols. Google Voice allows for cheaper calls to other countries, compared to the rates telecoms like AT&T charge, and free text messages. It can also transcribe voice mails into text, although that technology is far from perfect. Apple has taken verbal beatings this week at the Web 2.0 Summit, a conference in San Francisco, California, frequented by high-tech executives. Google CEO Eric Schmidt painted Apple's system as "closed," which clashes with his company philosophy, he said in his fireside chat on Monday. "The Android model is very different from Apple's on just about every point," he said. Apple CEO Steve Jobs said in his most recent earnings call that Schmidt's argument is a sort of smoke and mirrors, and called Android "fragmented." Jobs took shots at RIM in that call. So RIM co-CEO Jim Balsillie joined the fight on Tuesday at the Web 2.0 Summit, echoing Schmidt's sentiment about Apple's policies. He also appeared to express some contempt for Jobs' "sit back and say things" attitude. But with the Voice app finally available, Apple may be lowering the barrier on the types of software it will allow in its store, and at the same time smoothing its competitive relationship with Google.